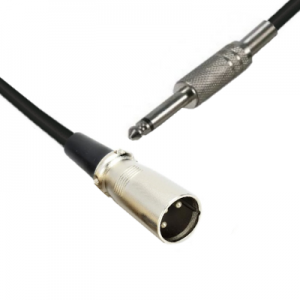 10 metre Unshielded short style Male XLR to metal Mono Jack with spring strain relief. *Bulk pricing is ex VAT. Order Code / SKU: 10USXM-MJ Category: XLR to Jack Leads. Tags: 1/4 inch jack, 6.35mm jack, 6.3mm jack, 6.3mm mono jack, mono jack, Patch Lead, patch leads, quarter inch jack, short style jack, TS jack. We reserve the right to change specifications / colours from those listed without notice due to Product Improvement and component availability. Photographs and other images are for guidance only and actual products may vary cosmetically from that shown. Prices are correct at the time of writing but Prices and Specifications will be confirmed at time of order. All products are offered subject to availability. Errors & Omissions Excepted.